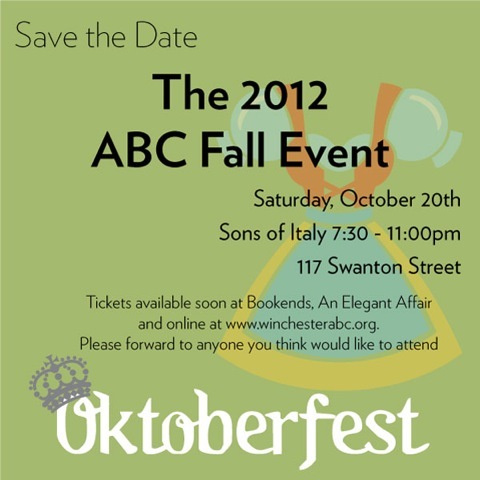 The 2012 ABC Fall Event - Oktoberfest - Better Homes and Gardens Real Estate The Shanahan Group proudly supporting the Winchester ABC Organization. With fall comes fall fundraisers when the Winchester community reaches out to show its support for local non-profits. We are so lucky to live in a town where the community comes together to help out worthy organizations. On October 20th there is a wonderful event for a great cause - The ABC event. ABC stands for A Better Chance. ABC is an organization that provides expanded educational opportunities to academically talented scholars of color. The Winchester chapter began in 1971 and has seen more than 70 students graduate, with most of them moving on to college. This event is always a fabulous time - this year's theme is Oktoberfest and will feature authentic German food, a DJ and complimentary wine and beer. The event also includes both a silent and live auction. I've attended this event for the past couple of years and joined the organizing committee for this year's event. I have been very impressed with the commitment from this team - such dedication. I hope you can join us!